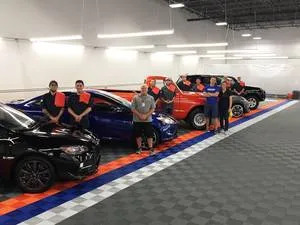 Prentice St. Clair is a known quantity in the detailing industry, particularly so to the readers of this magazine, who get to benefit from his knowledge and experience through his monthly “Auto Detailing” column. Prentice is a founding member of the International Detailing Association where he has earned several professional designations including Certified Detailer – Skills Verified (CD-SV) and Recognized Trainer (RT). I sat down with him recently to find out more about his background. at the Boeing Museum of Flight this last July. Kuczik: What’s your earliest memory about detailing? St. Clair: I remember wiping off the wax on my teenage neighbor’s sparkly-green Mustang with Edgar Winter’s “Frankenstein” blaring on his car stereo. As a nine-year-old, this was pretty cool. And I remember noting how the wax made the paint look better. How did you learn how to detail cars? I think I was born with the “detailing gene” because I’ve always enjoyed cleaning and reconditioning things; it’s so rewarding to see the final result of your work. But I must also credit Mom, who taught me how to houseclean. Plus I had plenty of practice on the family vehicles and later my own car. Do you remember the first time you got paid to detail a car? Of course! It was the summer of 1986, and I was working full-time at Swain’s Swim School in the San Fernando Valley. My boss noticed how great my 1976 orange Volvo wagon always looked and asked if I could detail his car. Eight hours later, I pocketed 35 whole dollars! Soon after, I did his girlfriend’s car, and realized I could make money detailing. To what do you attribute your success in building a detailing business? I had a book of 80 customers when I started full time. I am blessed with a natural ability to be friendly and make friends. This was reinforced and expanded while working in the late ‘90s with Worldwide Dreambuilders, a multi-level marketing business that had an excellent sales training system, through which I learned a lot about successful contacting and prospecting of potential customers. My wife Donna has always afforded me a lot of room to “do my thing,” as well as managing our household so that I could focus on the business. And I have turned to the helpful hand of God many times over the years, during both the good and the bad times. 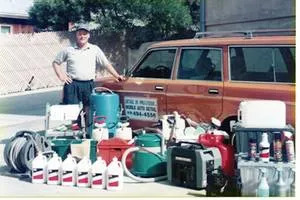 At what point did auto detailing become a full-time job? Well, I like to think of it as more of a “profession” than a “job.” Like many fellow detailers, detailing was not my first profession. Believe it or not, I have a Masters Degree in Applied Research Psychology. I had been working in that capacity for the Department of the Navy in San Diego for five years when my position was eliminated during government cuts in 1994. After spending a few months on a nationwide search for a similar job, I decided to open my detailing business. I had already been detailing as an avocation, working a couple of weekends a month making extra cash. In fact, I had a book of 80 customers when I started full time. And there were people I worked with that were waiting for me to open my business. Neighbors were also very supportive. How did you become an instructor in the detailing industry? My first five years of detailing full time were done on a mobile basis, out of that same ’76 orange Volvo wagon — it became sort of a trademark within my community. But as I came into contact with other mobile detailers, I realized the industry really needed help. I had just come from a high-level professional training organization (Navy Personnel Research and Development Center), so I knew that training was important for any professional to be successful. Showroom detail facility last August. My local supplier (Auto Beauty Products in San Diego) began offering semi-annual detailing seminars and I ate these up. It was a great chance to learn about new-to-me equipment, chemicals, and techniques. (Like the “extractor.” For a couple of the early years, I just didn’t bother with carpets and fabric because I didn’t know what to do with them.) It was also a great chance to meet other detailers, like Paul Weidler, CD-SV, RT; Bob Myers, CD-SV, RT; Dave Sanmugam; and Brad Burford, who taught me how to use a high-speed rotary polisher. All remain friends today. (Sorry this story is taking so long, Bob, but there’s a lot to tell.) Because of Auto Beauty, I joined the Professional Detailing Association, which provided a regional detailing seminar in 1997, where I met Steve Okun. Steve opened up several doors for me with the International Carwash Association, and I owe him a great debt of gratitude for those early opportunities. Be the first to show and the last to leave. Steve helped me break into writing for the industry trade publications and he also invited me to be a speaker at an ICA annual convention in 1998. Once the industry recognized that I can write well and speak well on the topic of auto detailing, I was off and running. I think I’m at about 400 published articles so far. I must take a moment to share this “aside,” because it has served me well in life. It was a saying that I learned while involved with Worldwide Dreambuilders —“be the first to show and the last to leave the meeting.” At a presentation by Steve Okun in 1997, pro-detailer Claude Harris and I asked if we could help him clean up after his presentation and sit down with him to chat afterword. This one simple move led to lifelong friendships with Steve and Claude, as well as all the opportunities from Steve. 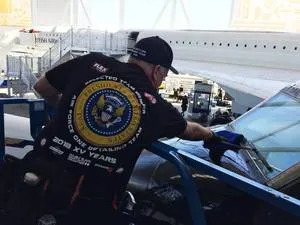 It was many of those contacts I made during the late ‘90s at the ICA and Western Carwash Association tradeshows that led to later teaching opportunities, including the development of a training curriculum for a leading southern California automotive reconditioning training center in 1999. I was the lead trainer at that institute for the next five years and also wrote and directed the highly popular Detailing for Profit Video Training Package. After that, I went out on my own as a consultant and trainer, but continued to work on cars to make ends meet. Since then, I’ve worked at numerous dealerships, detail shops, and car washes around the country. I’ve also had the distinct privilege to work with several large detailing supply companies to help them with their training programs and digital content. You are quite involved with the International Detailing Association. How did that come about? Well, again, it comes back to connections. This time it was Bud Abraham, who was gathering a team of detailing professionals to establish a new detailing association back in 2008. I was honored to be asked to sit on the first Board of Directors of the IDA in 2009. I served for six years and helped pen the IDA code of ethics and the certified detailer exams. to his other passion, music. Currently, I serve as the chair of the tradeshow and education committee, and, with the help of the committee members, we have provided numerous educational and certification opportunities at multiple events across the country. I am proud to have become a founder’s club member of the association in 2015, and I am very excited about the future of the association. What kind of recognition have you been awarded over the years? Bob, it’s hard for me to brag, but I’ll try. I received numerous awards while working with the Navy, including a “Meritorious Service Award” for work on the Navy’s Total Quality Leadership program. As a detailer, I received an IDA “Outstanding Service Award” in 2015, and in 2016 I was voted Mobile Tech Expo’s “Detailing Person of the Year.” I am very proud of these last two, as they are based on a vote of my detailing peers. Thank those who help and give credit where due.The culmination — at least to this point — of my career is to have been invited to join the select and prestigious 2018 team that annually works on the displays at the Boeing Museum of Flight, including the SAM970 Air Force One. What do you see in the future for yourself and Detail in Progress? I know from our casual conversations that you lead an active life beyond detailing. Tell me about your other activities? Sure you want to go down that “worm hole,” Bob? Well, you know I love music. I’ve fronted the classic rock/R&B/funk band The Openers since 2011 and I’m currently helping to put together a new band (possibly “Throw-back Thursday”?) with the help of industry friend and bassist Ian Rammelkamp. Someday we’ll perform for an IDA function, just you wait! 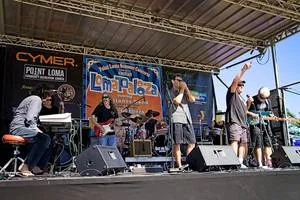 I also love attending live music and participating in production as a sound technician. In fact, I was the sound coordinator for our church for several years. In the last couple of years, I’ve been asked to take over the affairs of an elderly relative and also an elderly friend, which could lead to a completely new career as a professional fiduciary . . . who knows? In closing, can you sum up this interview with some of the guiding principles that have helped you in your life and career? Hopefully, my responses to your questions have had some common themes. I think these would include: gratitude, which includes thanking those who help and giving credit where due; confident humility, which means knowing that you’re qualified without pushing it in people’s faces; maintaining family and balance; giving back, which I truly believe results in greater rewards; relish friendships and relationships; and finally, having fun!